Borstkankertumoren met HER2 positieve expressie verdwijnen als sneeuw voor de zon met combinatiebehandeling van herceptin - trastuzumab en lapatinib - Tykerb, zo meldt Cancer Research UK en de BBC. In de groep vrouwen die alleen herceptin kregen hadden drie vrouwen (N = 83) een complete remissie, tegenover in de controlegroep ( N = 83) geen enkele vrouw. A drug combination – of lapatinib and trastuzumab (Herceptin) – before surgery shrinks and may even destroy tumours in women with HER2 positive disease within 11 days. The results are from a Cancer Research UK-funded trial* being presented at the 10th European Breast Cancer Conference (EBCC10) (link is external) today. In the trial, women were split into three groups and treated for 11 days before their surgery. Initially women were randomised to receive either trastuzamab, or lapatinib or no treatment – but halfway through the trial after evidence from other trials of the effectiveness of the combination the design was altered so that additional women allocated to the lapatinib group were also prescribed trastuzumab. The trial set out to study the biological effects of the drug combination by measuring biological markers of cellular proliferation after 11 days of therapy. But when trying to measure this, the researchers discovered that in roughly a quarter of the 66 women who received both drugs the remaining tumour was too small for the second measurement of cell proliferation. 17 per cent of the women receiving both drugs had only minimal residual disease – defined as an invasive tumour smaller than 5mm in size – and 11 per cent had a pathological complete response – meaning no biological sign of invasive tumour could be found in the breast. HER2 positive breast cancer is more likely to come back after treatment than some other types of breast cancer. It is generally treated with surgery, chemotherapy, endocrine therapy and targeted anti-HER2 drugs. Around 53,400 women are diagnosed with invasive breast cancer – with about 10-15 per cent of these characterised as HER2 positive breast cancer – and around 11,600 women die from the disease in the UK every year. Current treatments are effective, and complete response is common after three to four months, but the researchers say observing a disease response after 11 days was very surprising. Trial co-leader Professor Judith Bliss, director of the Cancer Research UK-funded clinical trials and statistics unit at The Institute of Cancer Research, London, said: “Our trial set out to try to use the window between diagnosis and surgery to find clues that combined treatment with trastuzumab and lapatinib was having a biological effect on HER2 positive tumours. So it was unexpected to see quite such dramatic responses to the trastuzumab and lapatinib within 11 days. Cancer Research UK scientists helped establish the link between some cancers and ‘growth factor receptor’ proteins on the surface of cells – a crucial early step in the development of Herceptin. Cancer Research UK also funded the clinical trials unit where the research showing that Herceptin can improve survival for people with a certain type of breast cancer was completed. * Abstract no: 6 LBA. “Effects of perioperative lapatinib and trastuzumab, alone and in combination, in early HER2+ breast cancer – the UK EPHOS-B trial (CRUK/08/002)”, Thursday, Clinical science symposium: HER2 positive breast cancer, 16.00-17.30 hrs, Elicium. They said the "surprise" findings, reported at the European Breast Cancer Conference, could mean some women no longer need chemotherapy. 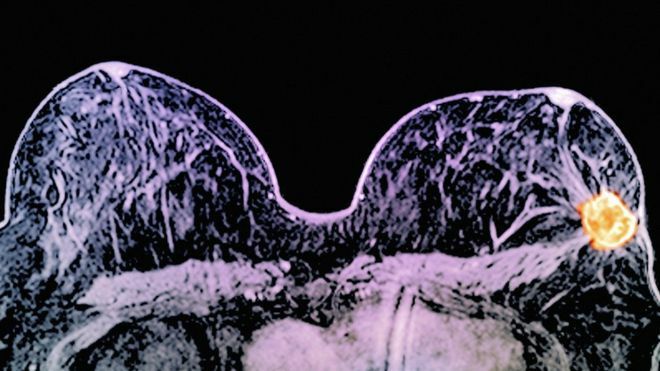 The drugs, tested on 257 women, target a specific weakness found in one-in-ten breast cancers. Experts said the findings were a "stepping stone" to tailored cancer care. The doctors leading the trial had not expected or even intended to achieve such striking results. They were investigating how drugs changed cancers in the short window between a tumour being diagnosed and the operation to remove it. But by the time surgeons came to operate, there was no sign of cancer in some patients. Prof Judith Bliss, from the Institute of Cancer Research in London, said the impact was "dramatic". She told the BBC News website: "We were particularly surprised by these findings as this was a short-term trial. Reageer op "Herceptin plus lapatinib doet borstkankertumoren Her2 pos. verdwijnen als sneeuw voor de zon bij borstkankerpatienten met beginnende borstkanker."